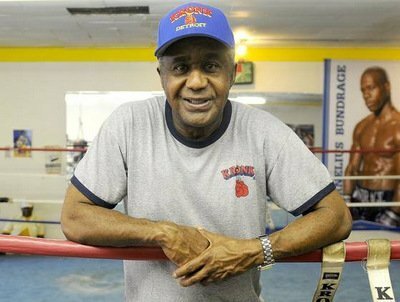 Legendary boxing icon, Emanuel Steward passed away peacefully with his loving family present last Thursday at the age of 68. During his lifetime he amassed a vast wealth of experience and knowledge of the sweet science. He had many roles in the sport as a commentator, manager and promoter, but it will be as a trainer that he will be most remembered in the history of boxing. As an amateur star he compiled a distinguished record of 97 fights with only 3 losses including winning the 1963 National Golden Gloves Bantamweight Championship in Chicago. He was inducted into both the World Boxing Hall of Fame in Los Angeles and the International Hall of Fame in New York in 1996 in recognition of his achievements and contribution to boxing. But he also leaves a legacy as one of the most respected and loved people in the sport; boxing fans around the world loved him and he loved them. No matter how busy or gruelling a schedule he had he always had time for a handshake, a photograph and a conversation. His warm smile and personable manner endeared to him to the hearts of everyone he met touching all their lives. He was always down to earth, in good form and full of generosity, he lived to give and that is what made him the people’s champion. Emanuel had been at the centre of the boxing landscape for over 40 years, his labour of love seen him develop the Kronk Gym in Detroit, one of the most successful boxing stables imaginable. In the early 1970s from a small boxing gym in the basement of the Kronk Recreational Centre in the south-west side of Detroit, Emanuel began training kids from the City’s impoverished neighbourhoods. The centre and gym was named after a hard working local Polish politician called John F. Kronk. During the last 4 decades the Detroit gym has been a cultivating ground for boxers of every age, weight, gender and nationality, from legendary world champions to young amateur prospects. By the mid ’70 onwards the young Kronk boxers were unstoppable winning titles galore at local, regional and national levels of the sport. He transformed the neighbourhood-boxing club into a world famous boxing gym, training thousands of amateur kids including the development of 2 Olympic gold medallists in 1984, Frank Tate and Steve McCrory. In 1977 Thomas Hearns and Hilmer Kenty were the first Kronk fighters to turn professional and Emanuel served as both their trainer and manager. Kenty was his first world champion in 1980 when he captured the WBA lightweight crown. Thomas ‘The Hitman’ Hearns went on to be one of his most successful fighter winning 6 world titles at different weights over a 23-year boxing career. During the 1980s Hearns enthralled boxing fans around the world under Emanuel’s guidance with historic and classic encounters against Roberto Benitez, Sugar Ray Leonard, Marvin Hagler and Roberto Duran. During his renowned career Emanuel set a world record training over 40 world champions including Waldamir Klitschko, Lennox Lewis, Mark Breland, Jimmy Paul, Michael Moorer, Julio Cesar Chavez, Oscar De La Hoya, Evander Holyfield, Mike McCallum, Gerald McClellan, Aaron Pryor and Leon Spinks. Over the last 10 years he had forged a close relationship and special friendship with world heavyweight champion, Waldimir Klitschko and Irish world title contender Andy Lee. He travelled extensively across the US and Europe as a true ambassador for the sport, but he loved to get home to Detroit. Like Joe Louis, Sugar Ray Robinson, Eddie Futch before him he is one of the City’s finest sons. The famous American writer Mark Twain once wrote ‘No man is a failure who has friends’. Emanuel had friends in every corner of the world; he lived a full and successful life doing something he loved and was passionate about. He made his mark and will be remembered with affection by all as a dear friend, a wonderful human being and one of the greatest trainers that ever lived. Condolences to his family, staff and close friends. God Bless Emanuel, May you Rest in Peace.